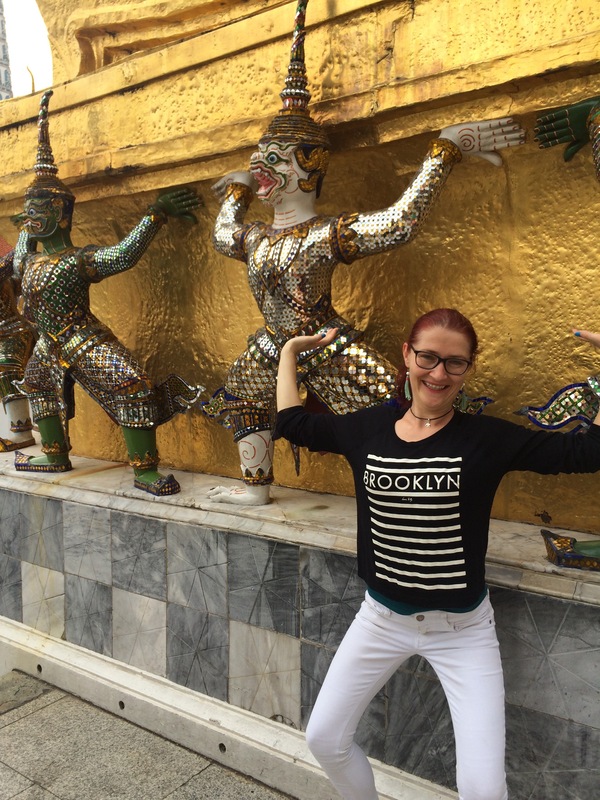 I was super excited to visit two of the most important attractions while in Bangkok. 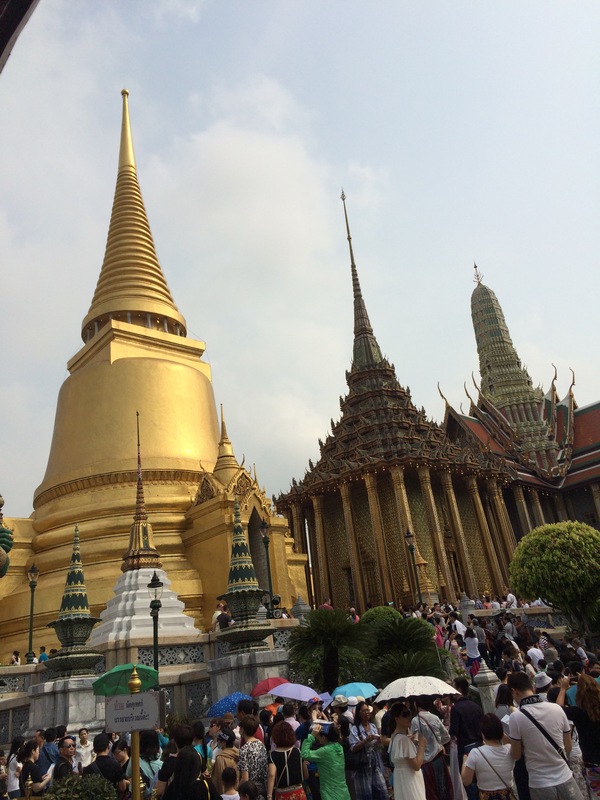 Even though I prefer the less touristy spots, Wat Pho and The Grand Palace can’t be missed. 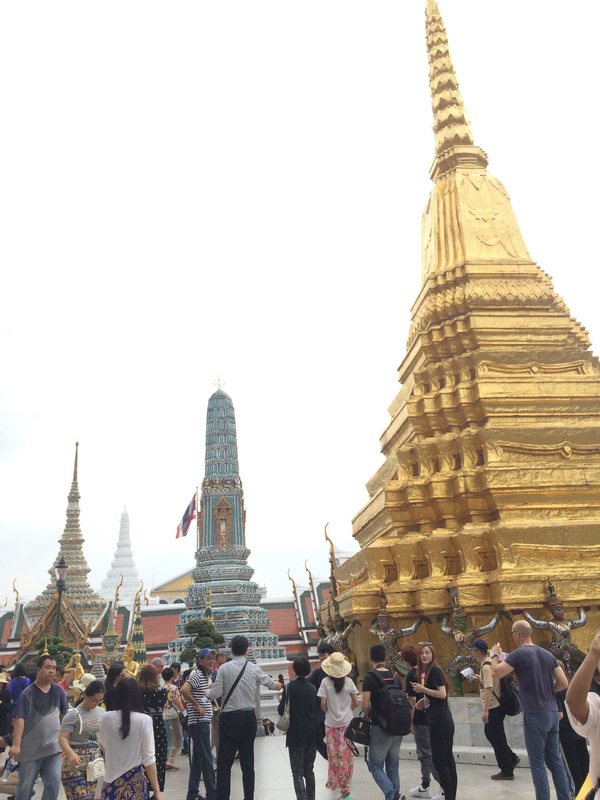 Both of them are extremely touristy, luckily when I went at Wat Pho it wasn’t such a huge crowd though. The ferry ride there is already an adventure itself, one of those adventures that I prefer not repeating. If the traffic on the roads of Bangkok seems unorganized and chaotic, check out the ferry on the river and you will kiss the ground when you get off. 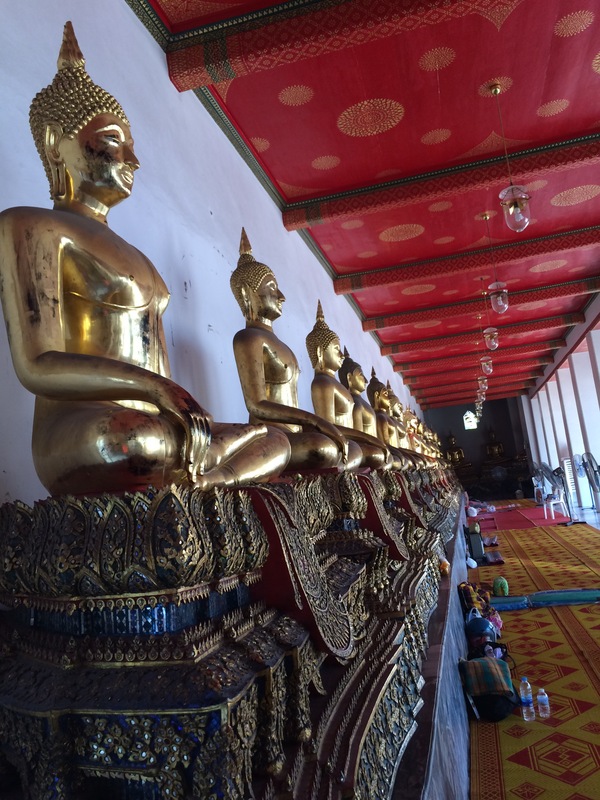 I didn’t like riding the ferry, but as I stepped to the fascinating Wat Pho I forgot about all the hassle I went through. The calmness you feel in this sacred place is probably better than any yoga session. First I was completely blown away of the beauty and the so meticulously decorated walls of the complex. It’s absolutely fascinating and I’m thinking what a hard work must be behind it. 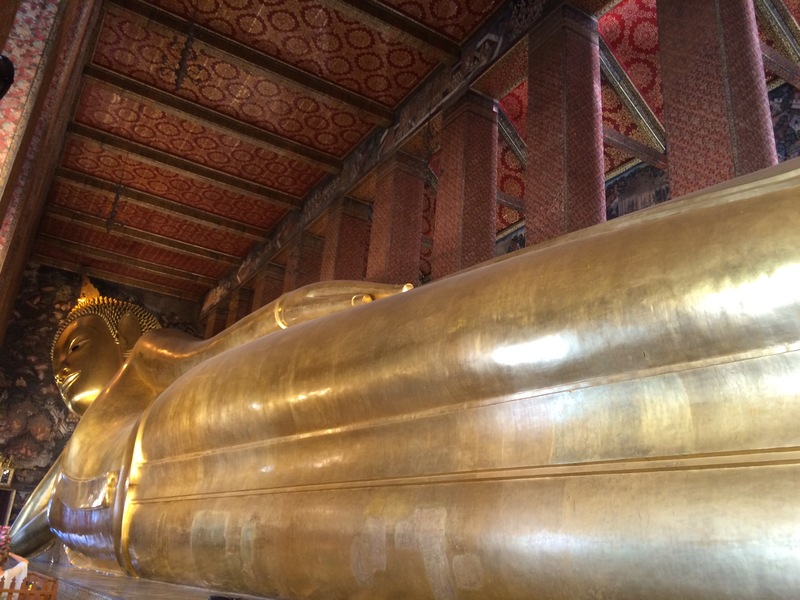 Wat Pho is famous for the huge reclining Buddha, so my friend, Amita and myself make sure that we check it out. We are both impressed, it is truly big and it leaves us breathless for a second. Several notes around it, saying ” be aware of pickpocketers”. I can’t believe that in such a place some mean people can take advantage. It didn’t happen to us, but seeing those notes made us be more conscious and keep an eye on our belongings every second. Quite sad, because you don’t enjoy as much the whole setting when you know that someone closeby might rob you, do you? However, the rest of the complex is calmer, tourists are all spread around, so we can explore every part in our own rhythm, calmly and observantly. I get excited at every step and probably repeat a thousand times : ” wow, that’s so beautiful”. With this occasion we can’t make it in time for the Grand Palace, so we leave that for the next morning and as we get there around 9 am is already so extremely packed with tourists from all over that you can barely move. Everybody is trying to get in but there’s no order whatsoever. That’s already annoying and for that reason I already think that I prefer Wat Pho. Finally we get in the complex but no chance to get rid of the big crowd at any time. Visiting the temples is another challenge, long queues and people pushing from all sides. When you eventually make it, at least inside you can relax a bit and feel a moment of calmness while admiring the Buddhas. As you may know, before entering a temple you need to leave your shoes outside, so just imagine what an aroma is floating in the air and your nose doesn’t know anymore what’s that fresh air. With other words, this visit is a fight for air, which is painful, but during this fight you see absolutely mesmerizing buildings, which somehow give you the energy to go on and survive in such conditions. I guess you could spend hours here, visiting several sights, but I gave up quite quickly. I’ve seen the most important ones and chose to escape the crowd. 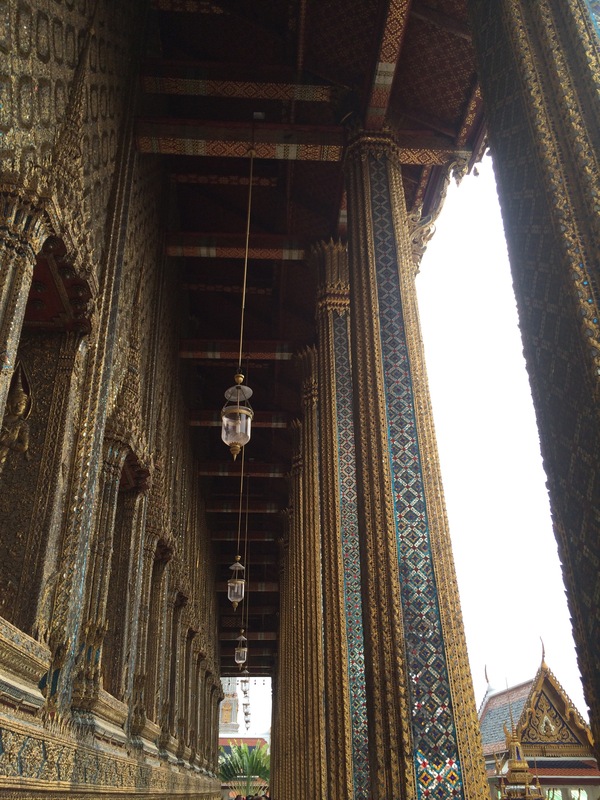 It was way too much for me and if I end up again in Bangkok I will skip Grand Palace for sure. On the other hand I do recommend in for every first timer. Just have a lot of patience with you and some water, you will need one more than the other!